We opened our Villa Klaic Guesthouse 41 years ago trying to put together all the good things a guesthouse can have : it is in a good location in a safe area where you can find all you need ; it is not too big, to avoid crowds ; it is clean and we are always willing to help. 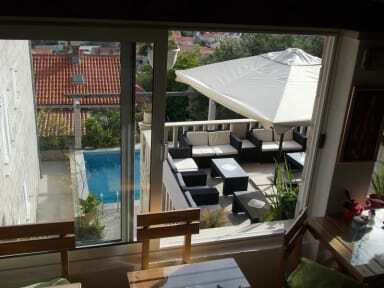 Villa Klaic is situated in the peace full setting overlooking Dubrovnik with uninterrupted views to the sea. The gentle coolong breezes refresh in the Adriatic sun. It is attractive 15 minute walk down to the Old Town. Villa Klaic is ideal for the independent traveller to enjoy the delightful spaces for families and couples alike. The Guesthouse is also available for groups . Villa Klaic is open all year-round with first class rooms all with TV, ventilator, heating , air-conditioning and all rooms have private shower-bath and toilet. We offer a specious sea-view terraces with BBQ, satellite TV + projector + big screen where guest can enjoy Happy hours with free beer and meet other travelers from around the world. You can have your breakfast or drink from the pool terrace and relax at the swimming pool during the day. we are here 24 hours. ** Check in time : 0 - 24 . ** There are no kitchen faclities available. ** The payment in full is expected on arrival in Cash. Together with interesting people from around the world, in a young, non-discriminatory and relaxed place, you may find that staying at Villa Klaic Guesthouse offers you much more than simply bed and breakfast. Please, take a look at our guests reviews, they speak for us ! Make a good decision and stay with us. It would be a great pleasure for us to welcome you in Dubrovnik and Croatia. Perfect! The host Milo is very nice, gives you good advice to plan your stay and drives you to the bus and ferry station. The place is super clean, the breakfast serves you sweet and savoury and fresh fruit and there is free beer all day. Go there! Wonderful Bed & breakfast in the hills a little above Dubrovnik Old Town. We loved our stay here! Very friendly owners who can give advice, nice view of the sea, little pool, good breakfast & coffee, clean room, you can park at a big street close to the house. Only thing you might not like is that there are a lot of steps (around 400?) to be walked from the old town. We did not mind, because the advantage is that it is a bit more calm than in the hectic Centre. Super B&B. Tolle Lage direkt an der Durchgangsstraße aber ohne Lärm. Und in die Altstadt von Dubrovnik wenn man keine Angst vor ca. 450 Stufen hat. Aber wenn man die geschafft hat erwartet einen ein Pool, Terrasse mit Lounge Möbeln und Freibier. Unbedingt vorher anrufen und sich erklären lassen wo das B&B ist. Auch mit GPS!! Sind mit den Motorrädern 3x vorbei gefahren. Sehr, sehr freundlich. Sehr gutes englisch, tolles Frühstück. Vor allem der Kaffee. Wir haben uns rundherum wohl gefühlt. Milo ist unwahrscheinlich gastfreundlich und bemüht dass sich seine Gäste Wohlfühlen. Er macht gute Vorschläge wo man Essen kann und der Tip mit dem Restaurant in den Bergen bei einem traditionellen Abendessen war gigantisch. Können die Unterkunft jedem weiterempfehlen. Vielen Dank Milo!